Thomas Slater’s latest novel is a non-stop ride of entertaining drama with suspenseful plot-twists and pulse-pounding action—from unholy corruption inside a church sanctuary to the insidious figures that lurk in the shadows of the dangerous city-streets. Wisdom Jones has made a deal with the Devil. Purchase price of a kidney: his life. But this Devil isn’t the malicious spirit who’s the total embodiment of evil: this one’s human, the CEO of the biggest drug operation ever established inside of Detroit city limits, and rumored to dabble in the black market for human organs. Though the tab may be staggering, no cost is too steep for the life of Wisdom’s precious mother. Her dying wish is to see her disobedient family restored to their once proper alignment with God. She lays her hand on her only responsible son’s head and makes him swear the oath. Wisdom isn’t ready to honor a dying wish. What good would it do to restore his mother’s health if stress from her wayward family delivered her right back to death’s doorstep? The Devil gives Wisdom a week to give his mother one more present: the gift of restoring her family back to its rightful splendor. No More Time-Outs follows Wisdom Jones while he prowls the dangerous streets in pursuit of reformation. 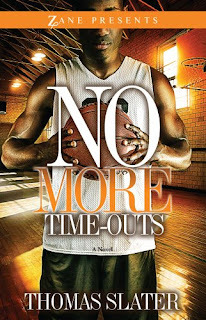 The clock is running and there are absolutely…no more time-outs! I received this advanced readers copy awhile back from Strebor Books, but honestly didn't think much of it because of the guy holding the basketball on the front cover. I'm not much of a sports person at all. This book is all action and sports play a very small role. I couldn't have been more wrong! After reading the back cover again, and realizing the book is set in Detroit, I knew I had to read it right away! I visited Detroit last summer for the first time and totally fell in love with the city. This family has issues, major issues! I love that the book alternates chapters between every family member, except the mom. The book is sort of based around her illness, so she is still a major part in it. Wisdom is a great character and he really gets the brunt of all the families issues. As for the rest of the family, they are on a huge path to destruction and the action keeps you wanting to read more. I am very excited for the sequel to come out and I have no doubt it will be just as good as this one! This book is being released November 2011, so make sure to go out and get your copy! Thanks to Stebor Books for providing me with a copy of this book to read and review. The author's website can be found here!